Who collects your household trash? In Barrio 18 de Mayo in Managua, Nicaragua, members of the Cooperativa Manos Unidas collect trash from house to house in a horse drawn cart. On Wednesday, January 12, I had the opportunity to go along with one of the cooperative’s founders, Don Henry, as he went along the steep dirt roads of the South Managua neighborhood. The city of Managua has been described as a collection of little pueblos; much of the city is made of residential neighborhoods with narrow streets and tight corners inaccessible to large municipal trash collection trucks. In the past, informal trash collectors worked where trash trucks couldn’t go, but these basureros were harassed by police and stigmatized by Managuans because their work was considered illegal. Don Henry, founding member of Cooperativa Manos Unidas, collecting trash in Barrio 18 de Mayo in Managua. CPU members carry heavy loads to the cart. It is especially difficult if the sacks break along the way to the cart. Now the city of Managua is working with informal collectors and local NGOs and private businesses to create cooperatives of informal collectors to improve trash collection and reduce public dumping along water ways. 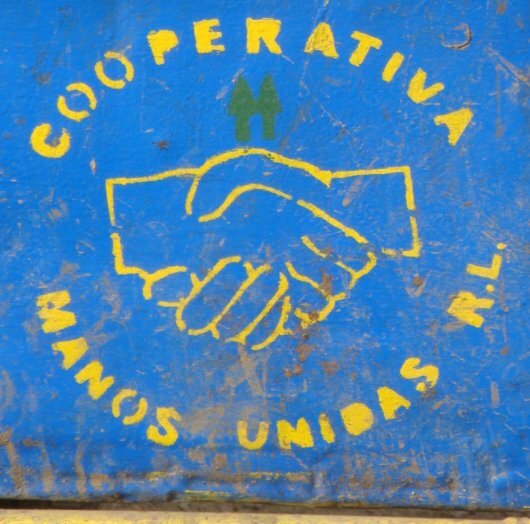 The formerly informal collectors of the Cooperativa Manos Unidas (CPU) now have a formal contract with the city, and thus, more secure working conditions. On Wednesday morning the members of CPU, dressed in their bright yellow uniforms, rode off in several horse drawn carts to collect trash in the neighborhood. As we traveled down a steep, narrow dirt road Don Henry rode atop his horse drawn cart blowing his whistle to call his customers. Children came out with sacks of trash and a few coins for Don Henry. Each household pays 3 Cordobas (about 15 cents) for each time CPU picks up their trash. The heavy loads are brought out in old rice sacks, re-used packaging and plastic containers. The sacks and containers are returned to households for re-use, leaving the loose trash in the cart. Each time he climbs into his cart to drive along the route Don Henry jumps on the load, compacting it with his feet. When his cart is bursting with trash, Don Henry drives it down to a municipal transfer where he hands his load over to city trucks that carry the trash to the Managua dump, the largest dump in Central America. 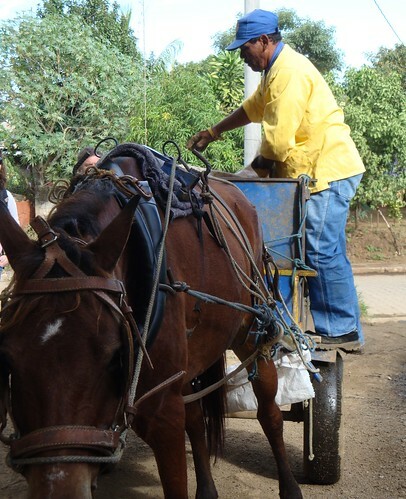 Manos Unidas uses horse drawn carts to collect trash from neighborhoods where municipal trucks can’t go. The system is simple and effective. Since the route in Barrio 18 Mayo began a year ago, about 50-60% of households in the neighborhood use the CPU service at least once a week. Paying the CPU members for trash collection is a new idea for most people, and has been somewhat slow to catch on. It means paying for trash collection service directly rather than through municipal taxes that pay for collection by trucks. 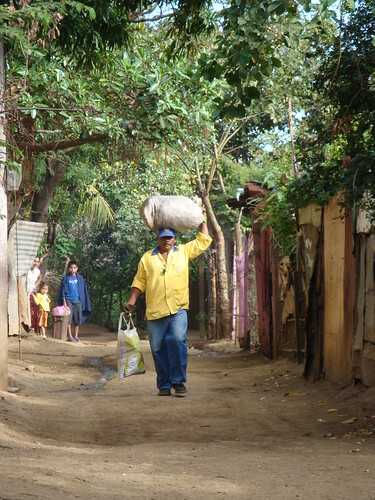 Don Henry and the fourteen other members of Manos Unidas have had to work hard to earn the confidence of the households on their routes because independent trash collectors have been stigmatized. In many cases, it was only after working to clean public areas in the neighborhood and offering to do yard cleaning for months that householders agreed to pay Manos Unidas to collect their trash. With government certification of their cooperative and official identification, CPU members are able to gain trust of their customers. Don Guillermo, another founder of CPU, commented that the CPU is committed to moving along two paths: One is to gain a more secure livelihood for the cooperative members, and the other is to perform a service for the communities where they work, improving environmental and public health conditions. Don Henry said that using horse-drawn carts is by no means an antiquated or “backwards” strategy for the CPU; by using horses and carts the CPU is better able to follow its two paths. 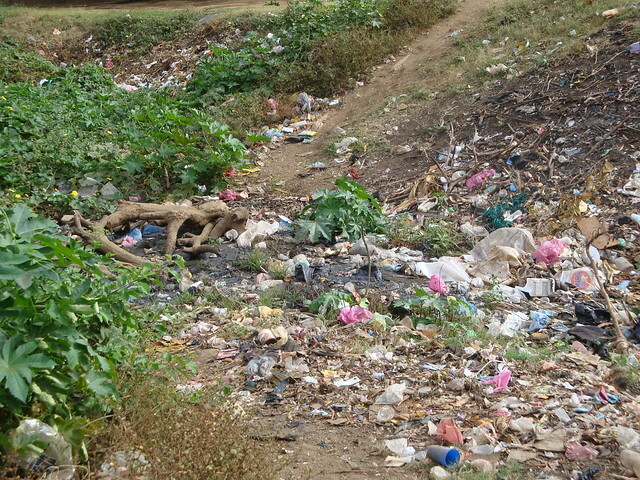 Trash accumulating in a water way in Managua. Manos Unidas wants to reduce the amount of trash dumped in water ways or burned in backyards to improve the environment and public health in Managua.